Several Berlin artists have been working since the middle of February on a large scale project entitled "Colors". A group of ballet dancers, a choreographer and a painter are exploring new ways of combining several art forms. They are taking three months to choreograph a ballet evening, while the painter Vadim Moroz prepares artworks on the same theme, working in parallel. This part of the project will be performed in the Music Hall of the Berlin Philarmonic (5.14.1992). At the same time V. Moroz will paint a picture of the ballet, which he will complete by the end of the dance. While the dancers "dance colors", Moroz will bring color to his canvas. 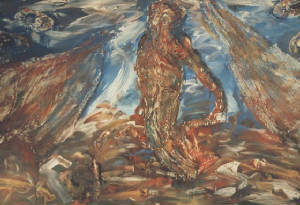 The artists are exploring how far dance and painting can influence each other, work together and produce new art forms. "Colors I", mix-technique on canvas, 79" x 59"
"Colors II" ("Solomee"), mix-technique on canvas, 79" x 59"
"The idea was developed in cooperation with the "Free Dance Theater", Berlin. Basic concept: to demonstrate the time element in painting. 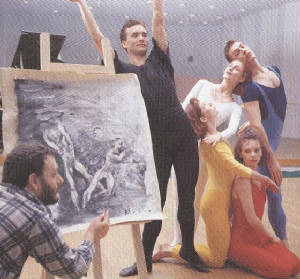 To achieve this, the "choreography of painting" was devised in a ballet conceived by the choreographer Holger Bey. During the performance, I painted the picture on the stage. The movements of the painter are part of the whole choreography and are linked to the movements of the dancers. 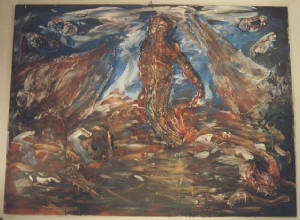 "Color I" was created in Music Hall of the Berlin Philharmony on May 14, 1992 and went immediately to a private collector. 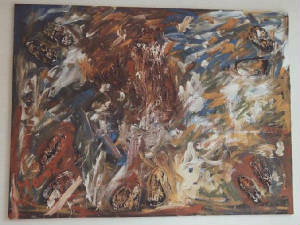 "Colors II" was created on June 4th, 1992 in City Theater of Jena and is in possession of the artist.